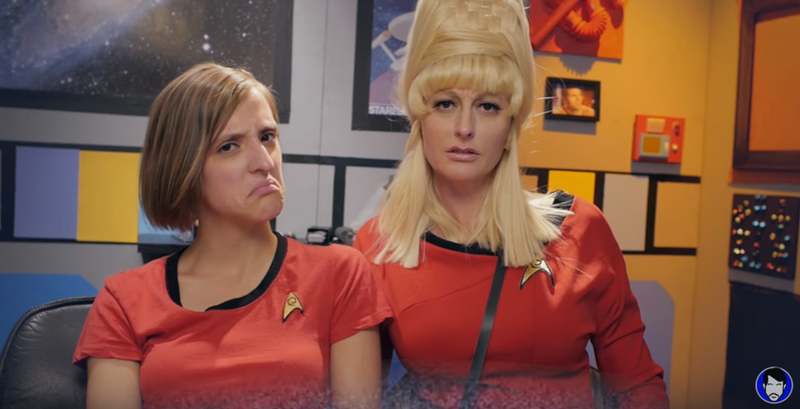 By far one of the most original and entertaining Star Trek related webseries of the last year has to be The Red Shirt Diaries. 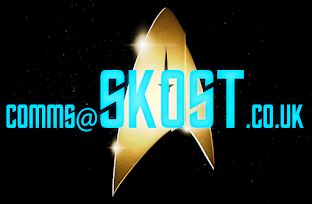 I've been a big fan of the show since it's first episode, watching each one religiously every week and looking forward to Mondays for my next few minutes of Star Trek-inspired escapism. 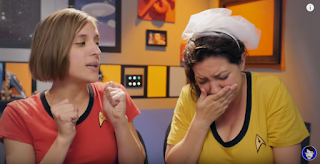 So while we can mourn the passing of this great show, let's take a gander back at the second batch of episodes from the Jawiin team running from The Menagerie, Part I to their finale. One of the big things that's immediately noticeable about the second season of the show is that the Kickstarter funds raised during the hiatus have been put to extremely good use. 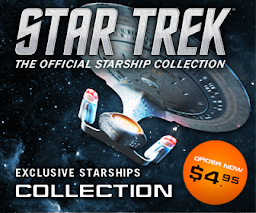 The set is a little more expansive, we get to visit the bridge and alien worlds, the uniforms are correct to the Prime Universe rather than a mix of Prime and JJ-verse plus there's a ton of more glorious USS Enterprise CG for ship fans to laud over. But at the core of the show is Ashley V Robinson's Ensign Williams and while all the changes do have an impact it's down to how Ashley portrays her character and carries each of the short instalments that makes it all work. 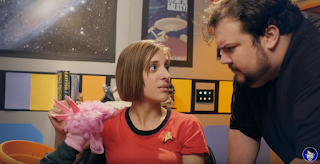 Through the 20 episodes she's joined by Cat Roberts (seen in Star Trek Continues), Larry Nemecek as Doctor McCoy one more time, Hal Rudnick and Nick Mundy from Screen Junkies as well as Jason Inman in various guises. 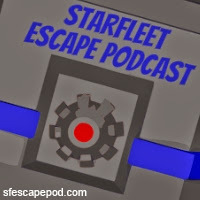 The Menagerie two parter started off the run with Captain Pike under a space tarpaulin while escaping Starbase 11 and Yeoman Rand (Cat Roberts - bit of a fan and still hoping I can sort out a chat) getting phasered for being too inquisitive (or just darn nosey). The concluding part saw the Talosians selling the perfect life to the ensign but managing to pick out just about every bad thing that's happened since the show began. The two parts aren't really connected more using material from the original story to expand upon and poke a little fun at. How Spock got away with having Pike on board always puzzled me. The Conscience of the King reveals Ensign Williams and her visiting sister, Tamara to be the biggest fans of Anton Karidian - so it's a bit of a surprise when it turns out he might actually be mass murderer Kodos the Executioner. Oh, and don't mention the Scottish Play. I really enjoyed this one, especially with the total twist in priority from a mass murderer to the effects of saying That Play's name. A lot of the comedy element comes from the audience's complete understanding of the original material and perhaps that's most evident in not just the tap-covered Captain Pike but also in Williams' excitement to be attending a space wedding in Balance of Terror. The groom, as we know, doesn't make it but again the priority is slightly flipped from Williams consoling her grieving friend to being unable to transfer the Romulan Commander's comm-line to the bridge. Shore Leave has Williams screwed over and left alone while the more senior staff (as usual) get to swan off down to the planet in an unusually "quiet" episode - well, it is once Uhura "does one" and leaves the ensign alone! The following Galileo Seven brings back Cat Roberts as Yeoman Rand(y) as Kirk has the ladies distract Commissioner Ferris while he attempts to rescue the shuttlecraft. We get to "experience" Williams' yearnings for Doctor McCoy at a whole new level here I have to say as well as her dissatisfaction at having to remain on the ship instead of being able to join Bones on the Galileo. 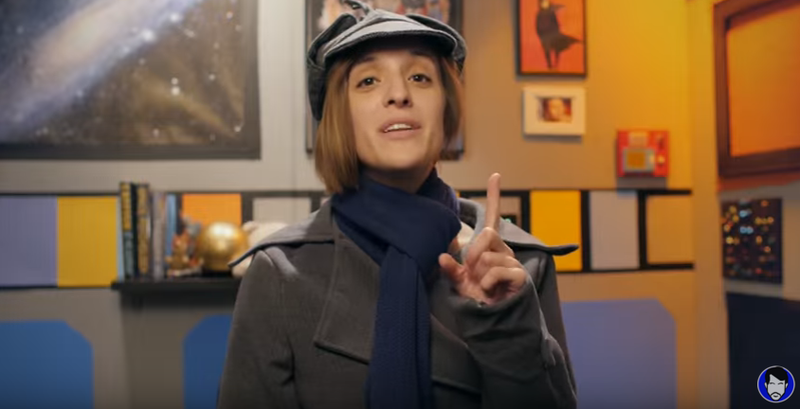 As for guests, it's funny to see Hal Rudnick from Screen Junkies camping it up as the Squire of Gothos and it's got to be one of the best episodes of the show produced just to see him skipping around the set and generally ruining Williams' day. Arena is one of those that followers of the series were absolutely gagging to see since it's the only true red shirt away mission of the 30 episode run and filmed on location at the iconic Vasquez Rocks which saw the original Kirk versus Gorn encounter. As with so many of the episodes, Williams ends up on the fringes of the encounter once more acting as our enthusiastic observer while managing to skip lethal away mission duties one more time. The time-jumping Tomorrow is Yesterday has her once more missing all the key action but getting totally sucked into the TV of the 1960's - Bonanza, Mr Ed, The Addams Family and more that inadvertently leads to her colleagues gatecrashing the party and getting rather annoyed when they have to get back to the future. One of my favourites from the second season has to be Court Martial just for the A Few Good Men homage and Old Timey Chris who must be the second worst layer of all time. Heck, computers untrustworthy which is a bit of an issue for him considering the Enterprise is, well, a giant flying computer. 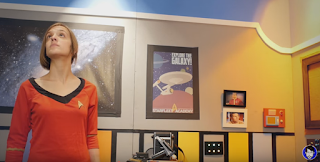 Williams' court martial for filing incorrect casualty reports turns out to be an error and not that Williams which "leads" to Yeoman Rand's disappearance from the series - at least according to The Red Shirt Diaries at least. Return of the Archons is the first of two appearances from Sulu in the show and does borrow a teeny bit from The Original Series in its reference to Red Hour and the wonders of Landru. It's a very neat encounter with religious brainwashing with Williams almost falling to the will of Landru after Sulu's sermon. Luckily there's some super-strong green scotch from Scotty to solve the mind control. Space Seed could have been difficult to work with given its seminal importance in Star Trek history. Without focusing on the facial features of Khan and instead reminding us of that ultra-fashionable red jumpsuit we have sleezy Mr Singh attempting several futile flirtations with Ensign Williams and coming across as a bit of an annoying dumbass who can't even recognise a particular woman - must be all the fatigue he's growing under. 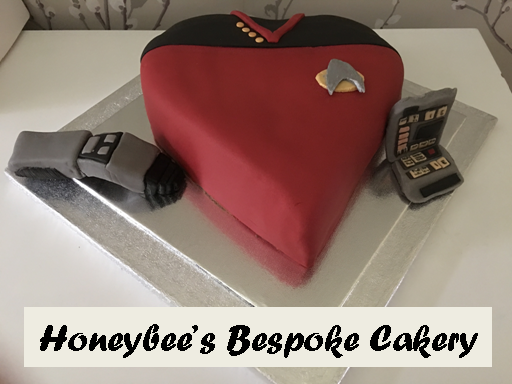 Be careful what you bellieve with A Taste of Armageddon because you can'r be certain if that really is Captain Kirk calling you for immediate disintegration on the surface. 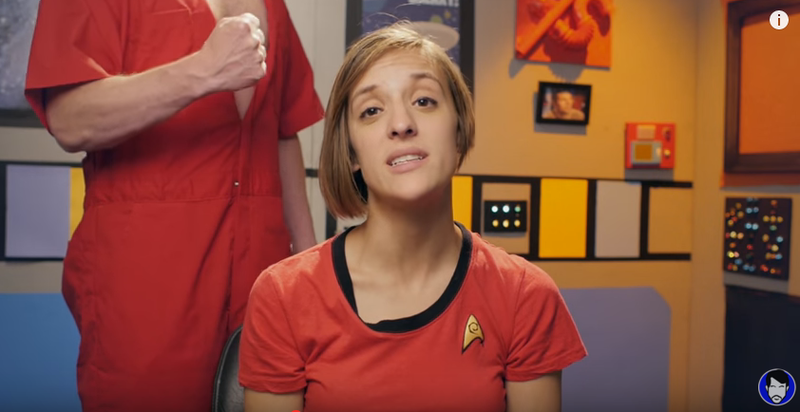 At least Williams has Scotty's help to recognise the fake Kirk communicating with the ship and his intimate knowledge of General Orders to ensure that no-one ends up beaming down for immediate death on Eminiar VII. This Side of Paradise gets Williams out of her quarters and onto the deserted Enterprise bridge to help Kirk regain control when the crew are affected by those "happy" plant spores. Being a security officer though, the ensign isn't too useful when it comes to anything to do with ship functions although she is pretty good at finding ways to button mash, fire the phasers and photon torpedoes. 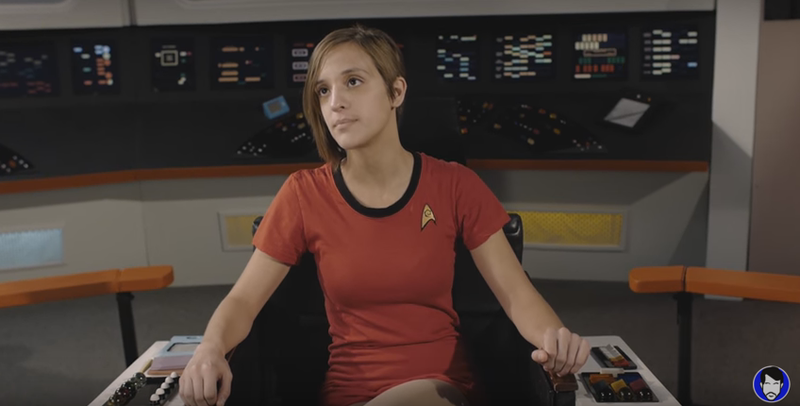 That probably makes Williams the perfect red shirt; it's not like she'll ever get to work the bridge with her life expectancy! Continuing the cameos from Screen Junkies, The Devil in the Dark has the very funny Nick Mundy dropping by as an engineer with a mission. 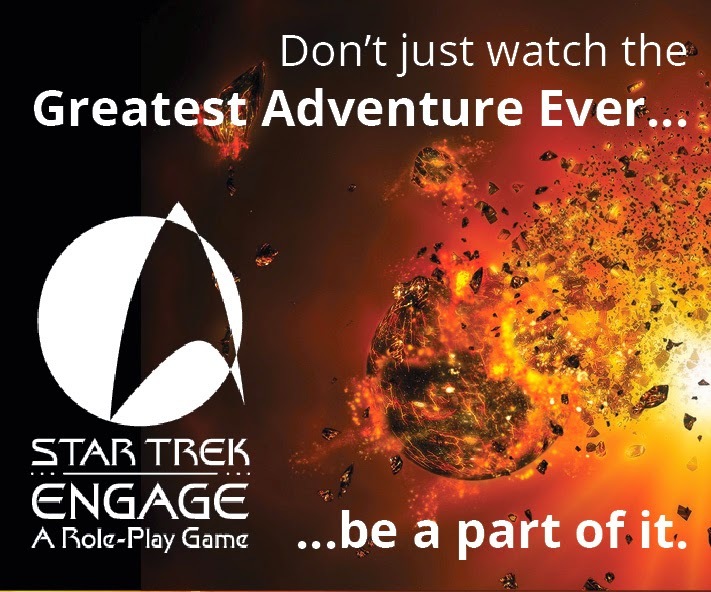 Unfortunately for Williams that mission is to strip her quarters of every useful element possible to save the ship while the red shirt ensign once again misses out on another seminal away team assignment.Lieutenant Mundy is one angry officer y'know even if he is very good at his job. For Diaries fans too there's the long awaited return of Gertrude which I'm certain will be seen as the show's greatest moment in years to come. "Instrument of violence!" is the line which will now be eternally linked with the episode that originally introduced us to the Klingons; Errand of Mercy. 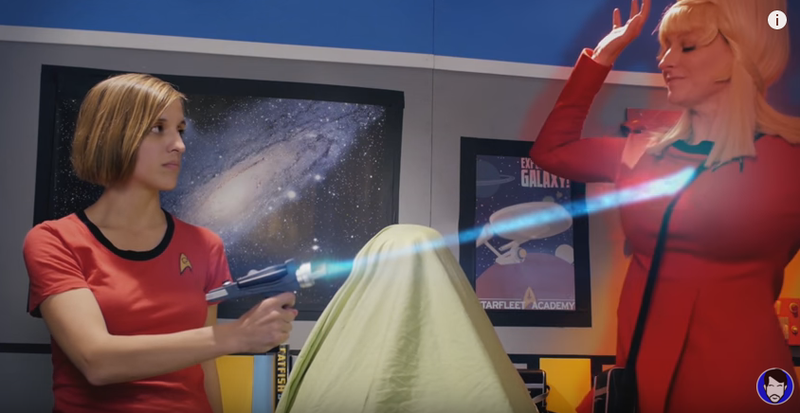 In regards to that show, Williams' experiences with two Organian light balls reminded me of just how silly their response to the Klingon/Federation standoff was. Fighting violence with violence that they are denying that is, well, violence, blows logic apart as does the backward thinking policies of having no women on their council which in itself shouldn't exist since they have no board of authority. Probably regarded as one of, if not the weakest episode of the first season, The Alternative Factor in the hands of The Red Shirt Diaries is far more interesting as the universe blinks in and out introducing us to anti-matter Williams who might not actually be quite as evil as you "expect" from another universe and there's not a goatee in sight. In fact this Williams has called her Dad, might have a bit of a crush on Khan and has saved the captain's life...all in a day's work....! 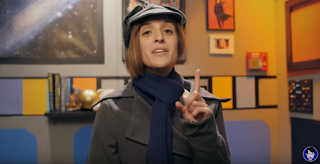 The City on the Edge of Forever has to be one of the best episodes of the whole run if only for the scope of the story in just a matter of minutes. With all the messing around in the timeline caused by Kirk, Spock and McCoy we get to experience what might have been happening on the Enterprise as Williams is tossed through a universe where Hitler rules supreme, the Mirror Universe and even something that "hints" at Trek's to come if you will. The script is superb and tightly packed into those few minutes so I have to applaud the scope achieved especially as it's referencing Sherlock and The Man in the High Castle making it a very clever little cultural commentary. Operation: Annihilate! 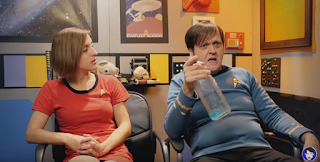 is the real finale here, closing off Williams' story as she helps hard-drinking CMO McCoy (Larry Nemecek) to realise the solution to the flying pancake issue the crew are facing. Nemecek is wonderfully extravagant here, certainly enjoying his bottle of blue booze way too much! 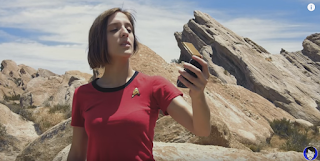 That discovery (from hitting a creature with a picture no less) leads to a promotion but in the excitement the ensign misses a vital call from her father whom we later discover has sadly died. It's a real punch to the stomach after such an uplifting, satirical and always enjoyable series but it works perfectly. Amok Time then provides a fitting epilogue as Williams finally meets her neighbour (Jason Inman) before shipping off to lieutenant's quarters complete with a longer sleeved and gold-braid endowed uniform. 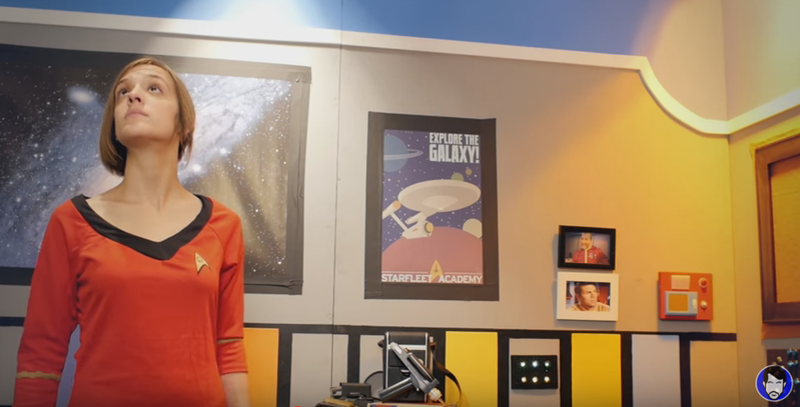 Needless to say that the subsequent incumbent of the room soon lives up the true reputation of an Enterprise red shirt. 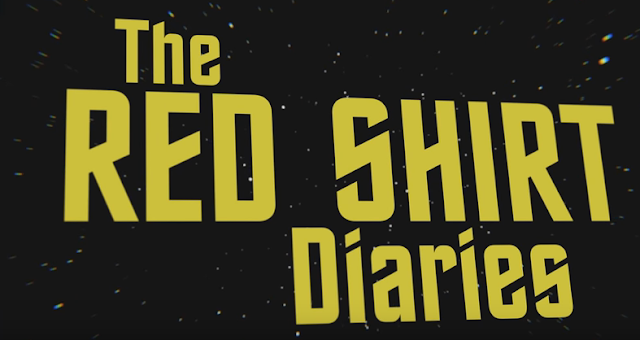 The Red Shirt Diaries have been a big success at least in terms of their vision and satirical content. It's disappointing to know that the viewing figures didn't live up to expectations versus the cost of producing each segment. The show has put a clever spin on the first season of a classic show, pointing out the twists, the asides, the clever - and silly - storylines and overall just how damn lucky Williams was to survive a full year on the Enterprise. 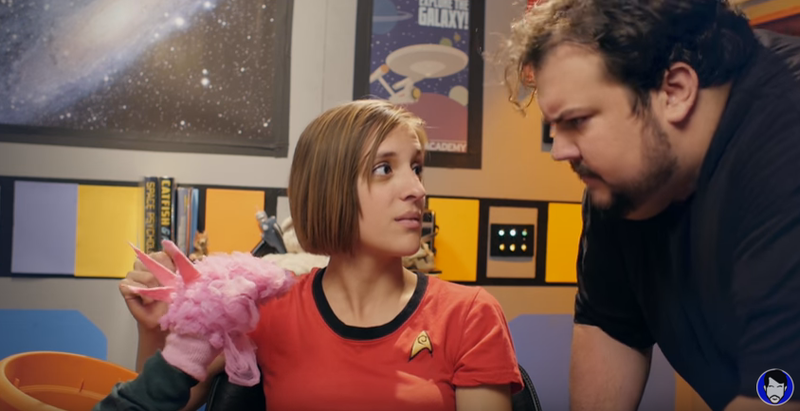 Given all the cool stories and the humour that permeates that web-series, it's a shock that there is such a kick in the last two episodes that counter the jubilation of Williams' promotion. The real tragedy though has to be the poor response to the show, the lower than expected viewing and in turn the fact that it doesn't justify the costs to produce each episode. As both Ashley and Jason have noted via social media, Amok Time does provide effective closure to the ensign's arc and see her move on so it's not as though there's not been any thought into how to round out the Diaries. 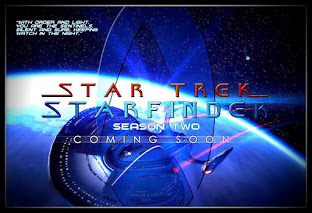 It will be missed by many for its unique spin on the classic first season of The Original Series and maybe one day, Ensign Williams will return (please!). You can watch all of The Red Shirt Diaries now over at the Jawiin Youtube channel now.